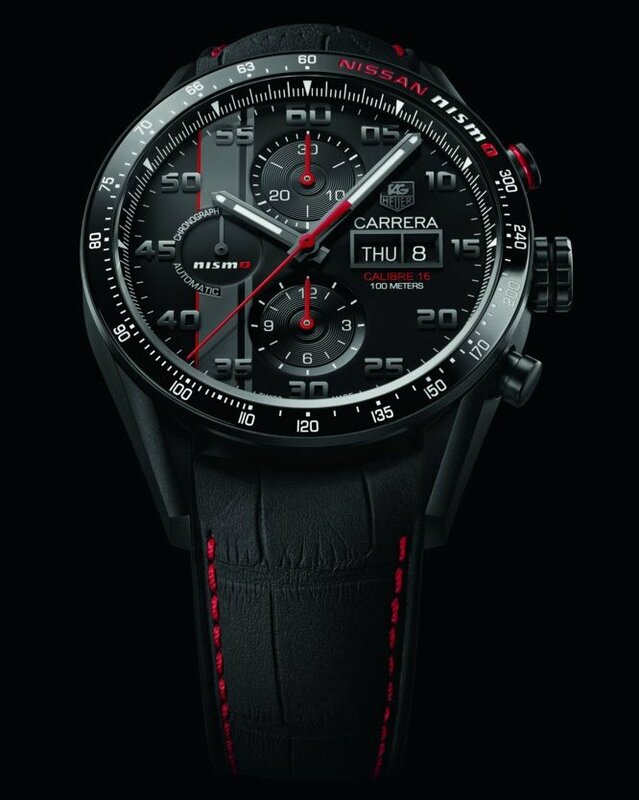 This year, Swiss watch brand TAG Heuer attends the Le Mans race on the track with Team Nissan NISMO and their incredible LMP1 hybrid race car. TAG Heuer has partnered the Nissan GT-R LM NISMO: the revolutionary new racing car from Nissan. An incredible car with a unique design, it is a behemoth with more than 1,000 horsepower, hybrid front wheel drive and a V6 3-litre twin turbo engine. It is the only vehicle in 2015 to be powered in this way – all the others are propulsion – not seen since 1997. A large prototype engine listed in the premier class (LMP1), it brings together the latest technologies in its kinetic energy recovery system, which is incredibly demanding to implement. Three cars have been made, with 9 drivers who will take turns to drive them. TAG Heuer marks this association by launching a special edition timepiece. TAG Heuer Carrera “NISMO” Calibre 16Day-Date Chronograph Special Edition : 43 mm, sporty – black with charcoal grey and red bands on the dial – in titanium, micro-blasted with titanium carbide, which is extremely resistant and lighter than steel, this watch is equipped with the famous calibre 16 movement, known for its reliability and robustness. The ceramic bezel is scratch-proof, with a tachometer for measuring average speed. Domed sapphire crystal with antireflective coating on both sides. The caseback is decorated with a Nissan NISMO decal. Soft Touch matt alligator strap with red top-stitching. Water-resistant to 100m.